Asian shares rocketed to three-week highs on Friday while the dollar softened on a report that President Donald Trump is taking steps to resolve a damaging trade war with China that has cast a pall over the global economy and financial markets recently. MSCI’s broadest index of Asia-Pacific shares outside Japan jumped 2.7 percent to hit its highest level since Oct. 10. It is up 6.4 percent on the week, on course to mark its best weekly performance in three years. South Korea’s Kospi gained 3.5 percent, the biggest gains in almost seven years, while Hong Kong’s Hang Seng jumped 3.6 percent. “Asia is the most sensitive to trade wars so Asian shares naturally have the most to gain from the prospects of a trade deal,” said Makoto Sakuma, researcher at NLI Research Institute in Tokyo. 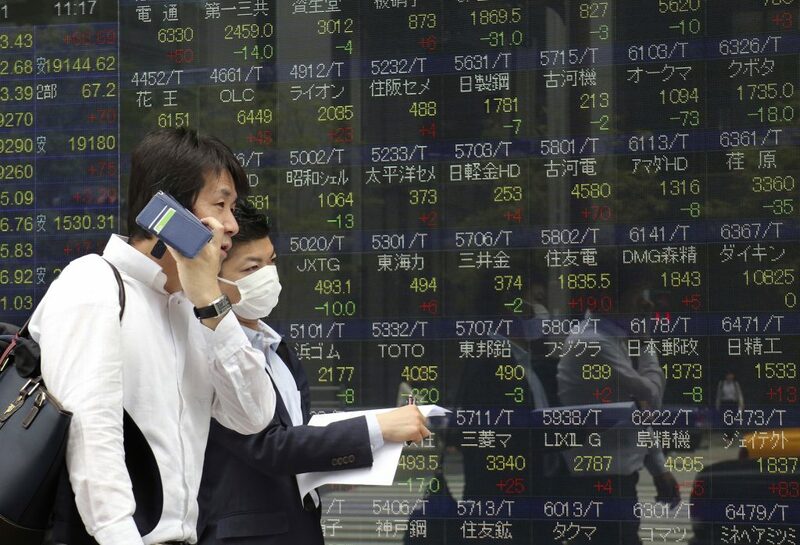 Japan’s Nikkei stock index rose 2.6 percent higher while U.S. S&P500 e-mini futures rose 0.7 percent. European stocks are expected to follow suit, with financial spread-betters seeing Britain’s FTSE rising 0.9 percent and France’s CAC and Germany’s DAX 1.0 percent each. Chinese shares surged and the yuan firmed. Chinese blue-chips gained 3.3 percent, and its start-up board added 4.5 percent, also buoyed by President Xi’s pledge on Thursday of more support for private firms. MSCI China gained 7.9 percent so far this week, about the double the 3.5 percent gains in MSCI’s broadest gauge of global stocks, ACWI. Bloomberg reported that Trump is interested in reaching a trade agreement with his Chinese counterpart Xi Jinping at the Group of 20 nations summit in Argentina later this month and has asked key U.S. officials to begin drafting potential terms, citing people familiar with the matter. One person said a sticking point in any potential deal is intellectual property theft, where the Trump administration has sought to take a hard line, and it was unclear if Trump was easing up on U.S. demands that China has resisted. Earlier this week, Trump was quoted as saying Beijing wasn’t ready to do a deal and he was prepared to slap more tariffs on China if his meeting with Xi was not productive. “While we are still cautious over a full resolution of recent tensions in the medium term, resumption of dialogue between Washington and Beijing would be good enough to investors for now,” said Tai Hui, chief market strategist, Asia Pacific, at J.P. Morgan Asset Management. On Thursday, the Dow Jones Industrial Average and the S&P 500 each gained 1.06 percent while the Nasdaq Composite rallied 1.75 percent. After the bell, though, shares of Apple tumbled about 7.0 percent after it said sales for the crucial end of year quarter could miss Wall Street expectations due to weakness in emerging markets and foreign exchange costs. Hon Hai Precision Industry Co. gained 1.4 percent, and Taiwan Semiconductor Manufacturing Co. added 0.4 percent. Tech rival Samsung Electronics Co. Ltd. also rallied, rising 4.7 percent. Investors will be looking ahead to a U.S. jobs report, due Friday morning, for more indications on the health of the U.S. economy and the clues on the pace of further interest rate rises. U.S. nonfarm payroll figures are expected to rise 190,000 in October from 134,000 a month earlier, with average hourly earnings seen increasing 0.2 percent in October after a 0.3-percent gain the previous month. Data from the U.S. showed cooling manufacturing activity in October as a measure of new orders hit a 1½-year low. That came after manufacturing surveys showed factory activity and export orders weakening across Asia as the impact of the trade war deepened. The euro edged up 0.15 percent to $1.1426 while the risk-sensitive Australian dollar gained 0.5 percent to $0.7240 . The dollar gained 0.3 percent against the safe-haven yen to 113.00 yen. Oil prices reversed earlier losses, with U.S. crude flat at $63.73 a barrel. Brent crude was 0.5 percent higher at $73.24.